It is by the sea, in the past, at Fort Williams in Cape Elizabeth just south of the city, and the last two years, on Portland’s Eastern Promenade Park overlooking a boat-filled bay, that I’ve especially enjoyed 4th of July fireworks. Yes, you can find more elaborate pyrotechnics and more spectacular, sky-filling finales in other US cities and towns. But what’s special about these fireworks is what comes before: families and groups of friends spreading blankets and unfolding lawn chairs, opening baskets and setting up tables, even lighting candelabras, and happily picnicking, while the Portland Symphony Orchestra performs stirring renditions of classic pieces like the 1812 Overture. Bent but unbowed, an old man waves a small flag in time to the music. A couple kids unfurl glow in the dark yo-yos. If Norman Rockwell were still alive, surely he’d be off to the side behind an easel. When it’s time for the Star Spangled Banner, not only does every hat (seemingly half of them bearing the red B of the Boston Red Sox) come off, but everyone—every man, woman, and child—sings our national anthem. Loudly, too. When Maine became a state in 1820, Portland was its first capital. Augusta, more centrally located, now bears that honor, but Portland remains the state’s largest city—with all of 62,500 residents. Yes, the metro area swells the local population to some 230,000, but the fact remains, that even blessed as it is with such city amenities as a symphony orchestra, downtown art museums and galleries, enticing shopping and great restaurants, Portland lives much more like a town. One feels instantly welcome here—no more so than in summer, when the generally pleasant weather (winter, that’s another matter) makes sightseeing and recreation all the more enjoyable. So what to do and what to see? A good place to start is with an expansive overview of the city from atop the Portland Observatory, an 86-foot high octagonal signaling tower built in 1807 by a former sea captain who’d spy arriving vessels far off shore with a telescope and then fly signal flags to notify paying local businesses that their ship was coming in. From this hilltop perch you can see three of the seven local lighthouses. Best known is Portland Head Light, said to be the most photographed lighthouse in the world. 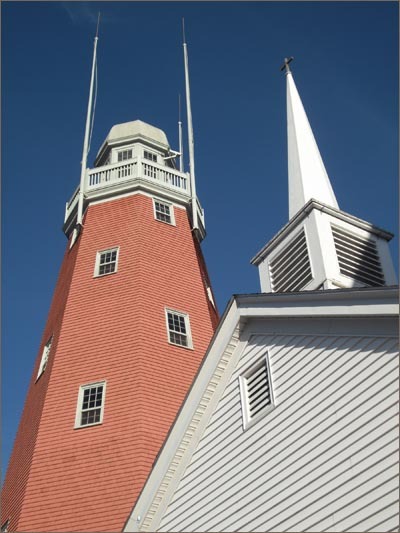 It was commissioned in 1791 by President George Washington, but is even better known as the subject of the Edward Hopper painting Lighthouse at Two Lights. It sits at the entrance to Portland Harbor in a scenic, cliff hugging state park in Port Elizabeth. There’s an adjacent museum, and nearby is a lunch spot almost too good to be true: The Lobster Shack at Two Lights. On warm summer days the line extends far out the door. Don’t be dissuaded. Enjoy the splendid view of Casco Bay while you decide between a clam roll or a lobster roll or the boiled lobster dinner to carry back to one of the many picnic tables. 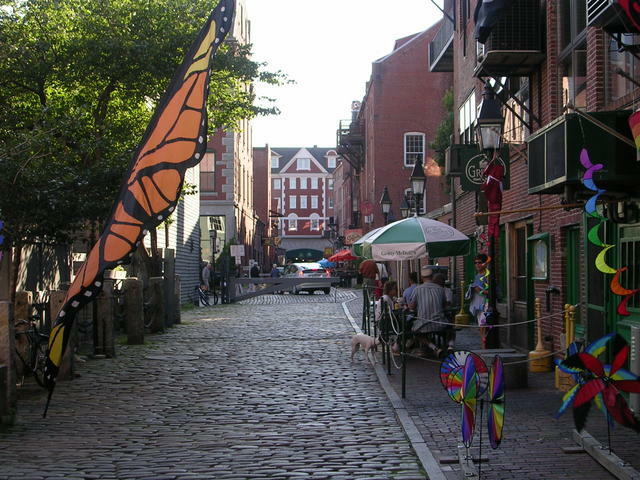 In the heart of Portland, salt air permeates the eminently walkable, shop-and-restaurant-filled section of the city known as Old Port. Brick sidewalks enhance the shop window strolling, as does the overwhelming tilt away from national chains in favor of locally owned, mom and pop stores. One shop, Fetch, abounds with natural foods, treats, toys, and gear for dogs (and cats). There’s a great cookbook store called Rabelais, which calls itself Thought for Food. A yarn shop called Knit Wit. Treehouse Toys. Even a specialty store called Condom Sense, which sells just what the sign says. Down at the docks, you can rent a kayak from the legendary Maine outfitter L.L. Bean and head out on either a 90-minute daytime harbor tour or a longer guided sunset tour. Or, take the 15-minute ferry ride to Peak’s Island. Not far from the landing you can rent a bike and easily circle the island. Upon your return, pray that the door is open to the house at 62-B Island Avenue. If so, you can tour the world famous Umbrella Cover Museum, where, likely as not, you’ll be serenaded by museum director and curator Nancy 3 Hoffman accompanying herself on the accordion as she belts out Singing in the Rain. Back on the mainland, evening options abound. Take in a minor league baseball game at the home park of the Portland Sea Dogs, the AA affiliate of the Boston Red Sox. 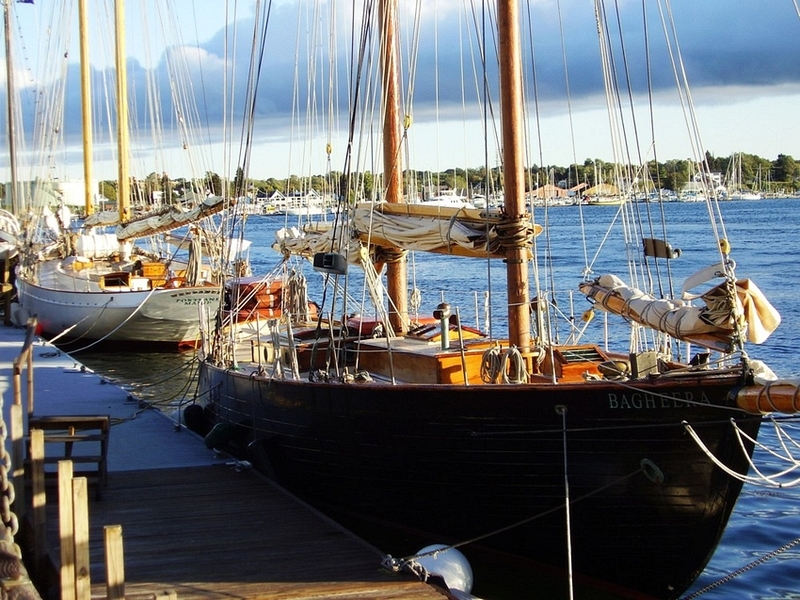 Or perhaps sign up for a sunset cruise aboard an 88-foot windjammer. Or settle in at an acclaimed restaurant like Hugo’s to enjoy the Maine shrimp risotto with smoked tomato butter and preserved lemon, or dig into the wood-oven roasted mussels at Fore Street. It’s choices like these—dining, shopping, sightseeing– that make this jewel by the sea shine so brightly. The Lobster Shack at Two Lights, 225 Two Lights Road, Cape Elizabeth. 207-799-1677. Lobster roll in hand, lighthouse in the distance, what’s not to like. Two Fat Cats, 47 India Street. 207-347-5144. Wonderful bakery with tempting treats. Don’t miss the mocha whoopee pie. DuckFat Café, 43 Middle Street. 207-774-8080. Panini sandwiches, fresh soups, duck fat fries—even the root beer and other sodas are homemade. Inn by the Sea, Cape Elizabeth. 800-888-4287. 15 minutes from downtown, a tranquil, upscale inn overlooking Crescent Beach. John Grossmann has written about food and travel for Gourmet, Cigar Aficionado, Saveur, and SKY. He was a finalist in the food journalist category of the 2010 Le Cordon Bleu World Food Media Awards. He is the co-author, with acoustic ecologist Gordon Hempton, of the book One Square Inch of Silence, (Free Press).